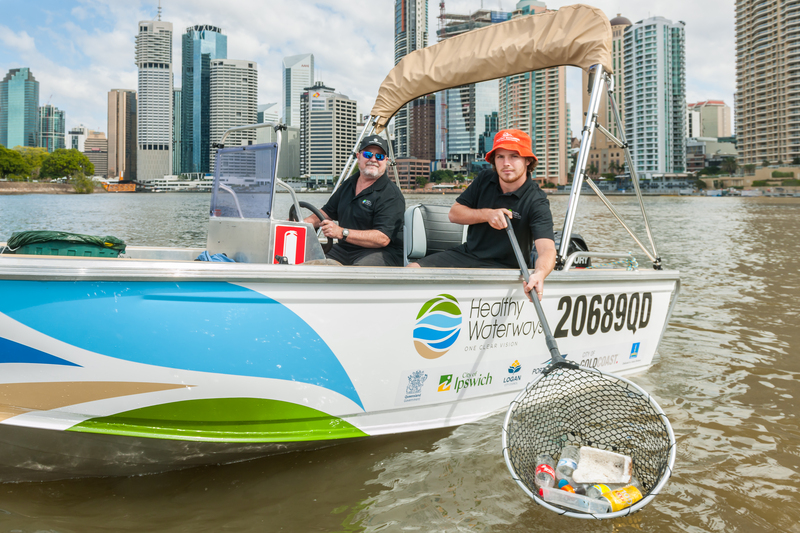 Based in Brisbane, Go2zone is brought to you by Healthy Waterways and Catchments, a not-for-profit organisation that works to protect and improve our waterways. Go2zone is an innovative new initiative designed to provide the public with a genuine alternative to single-use, plastic bottles. 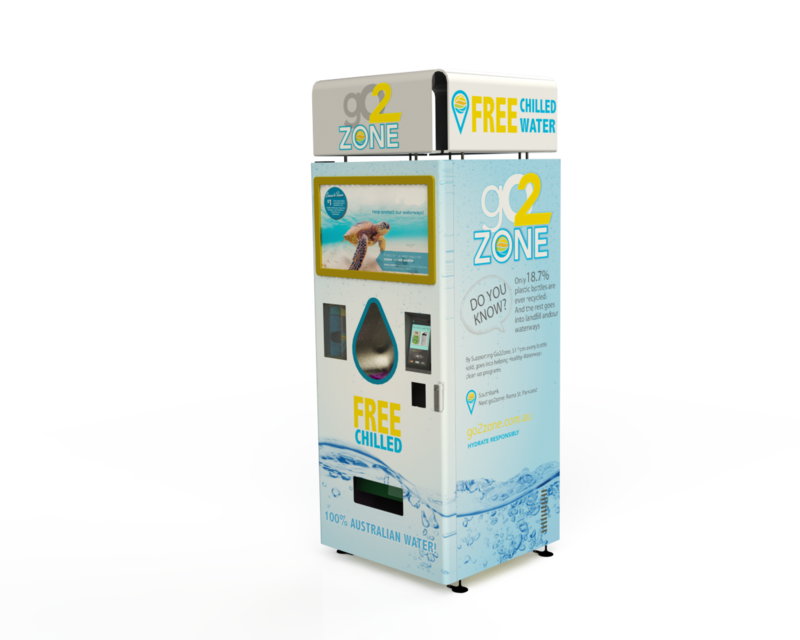 Our Go2zone (innovation patented) vending machines dispense free, chilled water that allow you to refill any reusable bottle. If you don’t have a reusable bottle with you, no worries! Go2zone machines also sell high quality stainless steel or glass bottles for you to get water on the go. Our team have been working tirelessly on the Go2zone for 3 years now to bring this initiative to the public and spark a change for a healthier environment, and particularly waterways in the future. After 25 years in the industry I have witnessed that despite a growing concern for the state of our environment, and the ongoing support of our members, we are still struggling to promote sustainable behaviours. The Go2zone is the first of it's kind to really shake things up and educate the public on how they can make a difference. Working at Healthy Waterways for the last 7 years, I have a strong appreciation for the hard work that a lot of people have put in to try to maintain and keep our environment beautiful. The Go2zone has great potential in delivering everything we dream of for our waterways. Together, we can make it work and support our environment in the long run. I have been in the field of environmental management and community engagement for over 15 years. I have a great love for nature and the connection it gives me, and as a mother, I want to create a change so that my kids have clean and healthy waterways and oceans in the future. Go2zone for me is a really great way for us to enable our friends, family and community to make the change that we need. As a keen photographer & fisherman, I have a deep passion for all things outdoors and Mother Nature’s intended beauty. As a father of two children I want to ensure our great Australian natural assets remain intact for the next generation & for our international visitors to enjoy. Did you know that in Queensland alone 1.6 billion single-use plastic water bottles are consumed every year! Many of these plastic water bottles are used just once and are then thrown away where they end up in landfill or in our waterways and oceans. At around $2 a pop, that’s at least $3.2 billion* in the bin and into our waterways. Australia is blessed with beautiful waterways that underpin our unique lifestyle and cultural identity. However those waterways are currently under threat due to waterway litter and plastic pollution. Marine debris is considered to be one of the most serious threats facing oceans and coastal areas worldwide. We want to provide the public an opportunity to reduce their use of plastic and plastic litter in our waterways. 30% of turtles found dead in Moreton Bay had ingested plastic. Studies show waterway litter has profound negative impacts on the economy, marine wildlife, coastline aesthetics and human health. this is expected to increase to two per minute by 2030 and four per minute by 2050." Social responsibility is important to us and any revenue generated from the sale of reusable water bottles goes straight back into supporting Healthy Waterways and Catchments programs that protect and manage our waterways for today and tomorrow. To drive key behavioural changes in consumers throughout the community to promote the protection and improvement of our waterways and oceans. To offer community members viable alternatives to single-use plastic water bottles to reduce plastic consumption and plastic litter in waterways and oceans. To offer community members simultaneous access to clean, filtered, chilled and free drinking water to improve overall community health outcomes. To generate substantial revenue to be reinvested into the Healthy Waterways and Catchments’ endeavours to support improvements to the South East Queensland waterways. Go2zone machines or reusable bottles gets reinvested into Healthy Waterways and Catchments initiatives and supporting the Clean-up Program. Influence change in consumer behaviour to reduce the impact of plastic bottle waste on the environment. Build a community of Go2zoners, who understand that using a Go2zone machine and carrying a reusable bottle is an expression of their environmental stewardship. Ensure commercial content is aligned with environmental sustainability and socially responsible positioning. 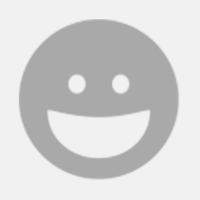 As a consumer, you can be rest assured your money is going to a valuable cause! With the success of this campaign we will have sufficient funds to stock the Go2zone stations with water bottles, allowing you to fill up on cold, filtered, clean Australian water for free and purchase stylish and reusable glass or stainless steel bottles. Money from every water bottle sold will go towards the Healthy Waterways and Catchments Clean Up program and other initiatives. 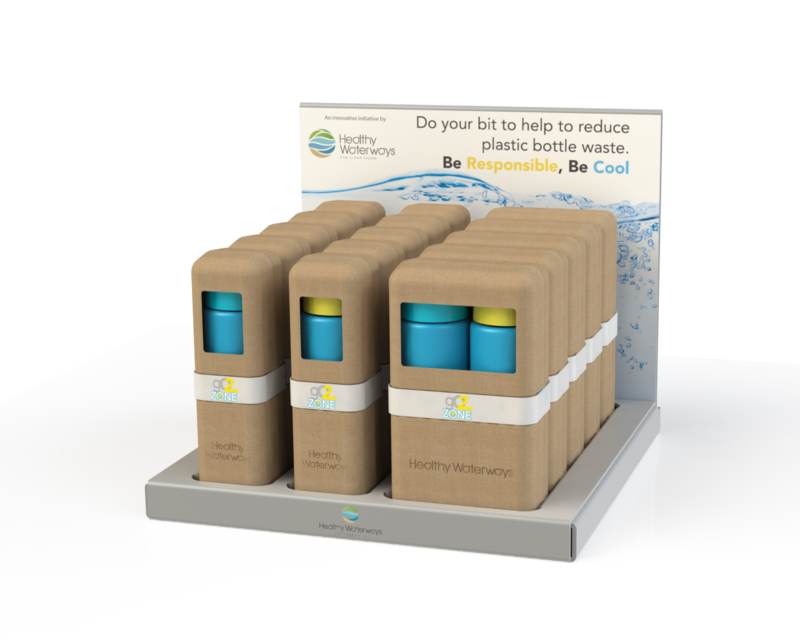 At this stage, our prototype Go2zone vending machines dispense Healthy Waterways Branded Bottles. 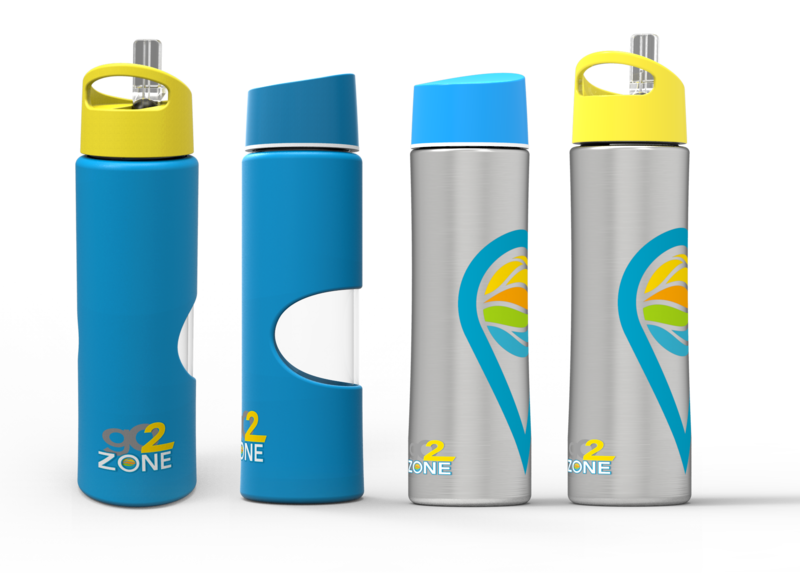 We have designed and created 2 styles of special Go2zone bottles in a Stainless Steel and Glass. To be able to place an order for our first batch of these bottles, and the production of our first round of Go2zone machines, we need to raise $75,000! Then $1 from every bottle sale will be donated back to Healthy Waterways and Catchments Clean-up program. If possible, we hope to raise enough funds to invest into making a bigger difference and generating a stronger online presence so we can spread the word to as many people as possible and share the Go2zone difference with a wider audience. A Junior Go2zone unit for your workplace with complimentary 100 Bottles and 1 year free maintenance on the machine. A Junior Go2zone unit for your workplace with complimentary co-branding on 500 Bottles and 1 year free maintenance on the machine.